to The Coverlet Book web site. Let's jump right into the good news. For a limited time, the price of The Coverlet Book is (US) $59.95 plus shipping! How long will this sale last? Realistically, we don't know. We would like to reduce the inventory, but more importantly, we would like to get the book into as many hands as possible. SImilarly, over at The Weaving Book, we have put Helene Bress's Weaving Book on sale for $39.95 + $5 shipping (US). Buying them together can save a few more dollars on shipping. We have a few ways to take advantage of this offer. Our preference is for orders through PayPal. This is fast and easy for everyone. However, we are aware that PayPal is not for everyone. For those that wish to order from Amazon.com, click to be taken over to our Amazon site. The books will cost a tiny bit more due to what we are charged for being on Amazon. Sorry. If you would like to use the US Postal Service, you may mail us a check or money order at Flower Valley Press, Inc., P.O. Box 83925, Gaithersburg, MD 20883 USA. We can also take orders by phone at 301-841-7020. If you call and don't get anyone, please leave a message and one of us will actually call you back. US Residents can use the button below to buy a single copy online using PayPal for $59.95 + $10 Shipping within the US. If you live outside the US or are interested in larger quantities, email us with your request and information and we will send you a PayPal Invoice. US Residents can use the button below to buy a single copy online using PayPal for $99.90 + $10 Shipping within the US. If you live outside the US or are interested in larger quantities, email us with your request and information and we will send you a PayPal Invoice. A number of people have asked us whether The Coverlet Book has material for them. This is often a question as to whether there are interesting patterns or information for weavers without 32 harness looms, or whether there is interesting information for those not intimately familiar with coverlets. While we try to answer these questions as best we can, the best source is from the author herself. We posed these questions to her and this is what she had to say. ...one was - to research and record the amazing data found within the coverlets themselves and in the early draft books. ...the other - to continue the exploration of weaving structures that I began in The Weaving Book. After all, I am a weaver and "weaving talk" kind of spills out of me whenever I have an ear. So, at the beginning of each chapter, as carefully as I could, I've taught the structure under discussion first in terms for the beginner and gradually adding all the intricacies of the weave. Read and learn all about the weave or stop when your curiosity is sated. For a little fun, turn to the beginning of the Double Weave chapter. If you or a friend have never quite understood how two layers can form simultaneously, perhaps a 'eureka' moment will come now. Of course there's a lot on Overshot - a whole volume, to be exact, and although most of the patterns are for four harnesses, several are for eight or ten. These multi-harness versions are shown -- and what do you know? --- Their structures often vary. This is all written up and ready for you to play with if you please. Hidden among these is a unique, pretty and interesting way of tying up and treadling a multi-harness version of Overshot. Twill? Well, there's the straight and pointed that go from four harnesses to as many as most of you have, Turned Twill (or Twill Blocks) and Twill in Blocks, and fancy, fancier and yet fancier Twills and lots of them ------- and much more. If you flip through the Twill chapter, you may wonder if perhaps I flipped, too, by including some of these variations. description of how upright and sideways trees are formed. While you're at it, why not take a look at a just-for-fun Evolution of Patterning chapter -- and the others! I had fun doing the research for this book because so many quirky and interesting things turned up. I've tucked lots of these into the appropriate chapter. And if you have four harnesses or twenty-four or more harnesses, there's plenty of material for you. May you have fun as much pleasure in perusing this book as I had uncovering all of the material. Warmth, beauty, and art: our early American handwoven coverlets have it all. And, each one is unique and interesting. Here is a fascinating study - all based on original research from primary sources: from the coverlets themselves, the early draft books and collections of early individual drafts. The author, an intensely curious weaver, explores all the facets of each coverlet, each of their many structures and variations and then, with gusto, passes this information along to the reader in a readable, meaningful and interesting way. These volumes are filled with photographs, many in color, some in black and white, and many with close-ups. There are drawdowns of each coverlet. Charts, fascinating facsimiles of early drafts and explanations galore fill the pages. The author incorporates these photos, drawdowns, facsimiles and charts to make complex concepts easy to understand. A chapter is set aside for each weave system and its variations: Overshot, Twill in its many forms, Turned Twill, Double Weave, Summer and Winter, Star and Diamond, and some miscellaneous weaves. For each of these chapters there's an overview of the coverlets analyzed followed by a detailed discussion and explanation of its structure. Then there's a gallery featuring a wide range of coverlets, a drawdown and photograph of each plus an off-the-cuff description of it and a box containing its vital statistics. Always, there are anomalies and they're discussed with great delight. How do you read early drafts? What do they look like when woven? What can we learn from them? All this is explained and shown. Many of these patterns are extraordinary! There's a chapter devoted to the motifs found on the coverlets, with charts showing the progression of each motif from its simplest to most complex form. If you're a pine tree admirer, look in the Trees and Churches chapter for a host of trees, their origins and how to weave them. Ever wonder how patterning evolved? Possibly the way explored in the Evolution of Patterning chapter, a just-for-fun chapter with room for serious thought. There's so much more. From the casual coverlet lover or collector to the serious weaver, each will find much to learn, much to add to his or her repertoire - and so much to enjoy. Perhaps the best thing about the book is the author herself! She writes as if she is speaking to you as a friend. You get the feeling that she is right there with you as you are going through the book - explaining, clarifying, just holding your hand making sure that everything is crystal clear. 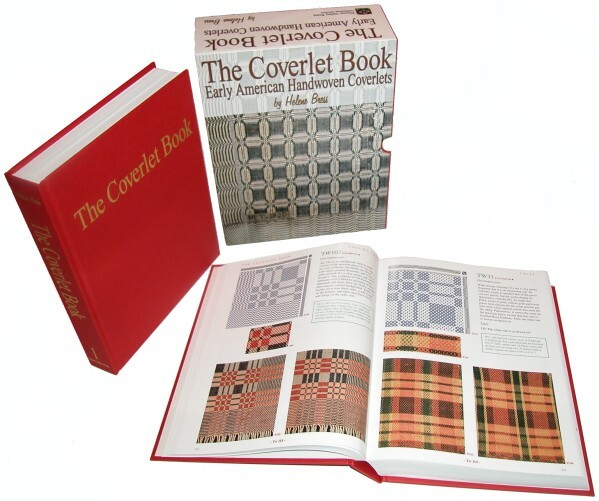 The Coverlet Book is a two-volume hardcover boxed set. The Coverlet Book is over 1,100 pages long and contains over 1,000 photographs, over 2,000 drawdowns and over 300 diagrams. Helene Bress is also the author of: Inkle Weaving, The Macramé Book and The Weaving Book. We have posted sample pages from The Coverlet Book on this site for you to enjoy and get a feel of what the book has in store for you. In order to give you the best representation of the book, these files are in their original size, making them quite large. These pages are in Adobe Portable Document Format (PDF). If you do not have a PDF reader on your computer already, you may download a free reader here: Free Adobe Acrobat Reader.